When I was a kid, one of the greatest things in the world to me was the challenge of breaking DOS copy protection of the time. 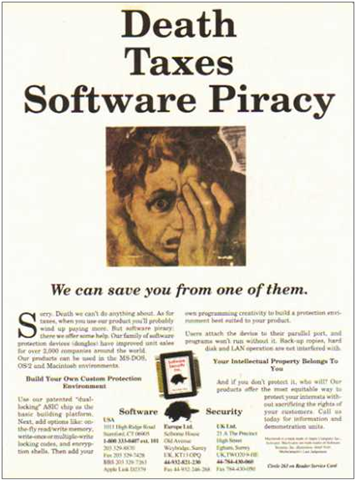 And yes, this implies that I pirated software when I was in Junior High. I fully admit it. Hey – I had an allowance of $3/week. What do you want? While I sometime leveraged tools like CopyIIPC & the Central Point Option Board, I’m dead certain I spent far more time in DEBUG.EXE searching machine code for INT 13’s than actually using any of the software that I pilfered… and with good reason: I had copies of products like “Multimate”, “dBase III”, “Cornerstore”, “Lotus 123”, “WordStar”, “Framework”, & “Mavis Beacon Teaches Typing”. Much like how a hacker’s goal isn’t necessarily to do anything with the computer system they’re attempting to infiltrate but rather simply to see if they can break in, the wondrous goal of cracking copy protection was simply the knowledge of being able to subvert the protection. Nothing bored me more that some company that just used lame copy protection that could be subverted with a single machine language instruction change. You have to understand that this was a cat & mouse game: Breaking copy protection was like puzzle solving and the challenge was delicious. Creating copy protection however was the art of making the puzzle & I to this day, greatly admire those that create these techniques. Very little of this appears to remain documented on the Internet but I hope that some day someone will write a documentary about this back & forth that continues to this day. I’m going to blog a few of the techniques & their names that I remember off the top of my head in subsequent posts. This entry was posted on Sunday, February 6th, 2011 at 10:25 pm and is filed under Uncategorized. You can follow any responses to this entry through the RSS 2.0 feed. You can leave a response, or trackback from your own site. Interesting article. Just for the record our software protection, CodeMeter, has yet to be hacked. We have had a few hacker competitions but no-one won the prizes. If you ever get a chance to hear archivist/technology historian/documentarian Jason Scott speak about “pirate memos,” run, do not walk, to the event. He did an off-the-cuff talk at DEFCON that shed light on seldom-seen aspects of that whole issue. Jason’s the producer and creator of the documentaries BBS and GET LAMP, which I recommend if you’re at all interested in the way things were. One amusing highlight of his talk about piracy was the revelation that one of the early anti-piracy organizations appears to have poached people and lifted content _directly_ from their leading counterpart’s media campaigns in order to get started more quickly. And yes, I saw the Jason Scott video on piracy ‘back in the day’. I think it was called “Your Missing the Point” or something like that. I fittingly ripped the entire video down and printed a DVD of the lecture. Anyway, I’m glad you commented. I’ve been so ridiculously heads down at work that I’d completely forgotten I was going to write a series of posts on copy protection techniques from the 80’s and 90’s.